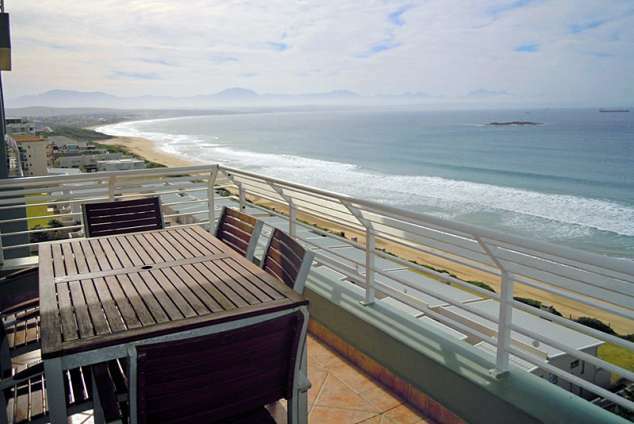 Ocean Two - Mossel Bay Accommodation. Situated on the beach front of Diaz George mountains. The immaculate white sand and swimming beach stretches for several kilometers. The unit offers self-catering luxury holiday and business accommodation with three fully equipped bedrooms, two with double beds and one with a double bunk. There are two bathrooms, one being an en-suite. This apartment has 180 degree sea view from two bedrooms, the tv room and the balcony. The kitchen is equipped with crockery and cutlery for 8 people, a microwave, built in stove and extractor fan, fridge-freezer combination, a dishwasher, toaster and kettle. The dining room consists of a dining room table with 6 chairs. The TV room offers satellite tv, M-net and the normal SABC channels. There is also a self-help built in bar with a bar fridge. The balcony has its own gas braai with a wooden patio table and six chairs. The apartment has a 24 hour security officer with a security gate and controlled entrance and exit. Access to the swimming beach is also controlled with a security gate. Besides basement parking, there is also a lock-up garage. Because of the fantastic locality, all activities are right on your doorstep. Besides all the sea activities, a health spa and indoor warm swimming pool, a cocktail bar and restaurants are walking distance from the unit. Cinemas, fast-food outlets and the Casino is also in close vicinity of the apartment. The MosselBay golf course as well as the bigger food stores are also close. There are lots of activities for children, a super tube is close by and horse rides can be taken on the beach. The George airport is approximately 30km where various car rental options are available. Irrespective of age, Ocean Two offers everyone the full spectrum of accommodation and entertainment. You owe it to yourself! 57782 page views since 21 Oct, 2005.